A government minister's wife has been appointed as the new chief inspector of schools in England. Former head teacher Christine Gilbert is married to Home Office minister Tony McNulty. The Department for Education and Skills has denied "cronyism". Ms Gilbert, who takes up the post in October, is currently chief executive of Tower Hamlets council in London. She becomes the sixth person - and the first woman - to run Ofsted, succeeding interim chief Maurice Smith. An education department spokesman said: "Christine was appointed on merit following a rigorous open competition conducted in accordance with the guidelines of the Office for the Commissioner of Public Appointments." He added: "Her track record in education at Tower Hamlets speaks for itself." The borough's school test results in had risen in recent years, the spokesman said. 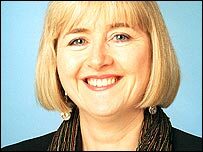 Ms Gilbert won a CBE for services to education and local government in the New Year's Honours list. Ms Gilbert said: "I am delighted to have a chance to fulfil such an interesting and challenging national role, especially as Ofsted moves towards a new single inspectorate covering education, children's services and skills." Education Secretary Alan Johnson said: "I am delighted that Christine Gilbert has been appointed to this crucial and demanding position, and wish her every success." His Tory shadow David Willetts said: "What parents will care about is not whether Christine Gilbert is married to a Labour MP, what they will care about is whether she uses Ofsted to press for higher standards in our schools. "If she tackles that with vigour and political impartiality she will have our support." Liberal Democrat spokeswoman Sarah teather said Liberal Democrat Shadow Education Secretary, Sarah Teather MP said it was important to have a chief inspector who was not tied to any political party, who could act independently and in the best interests of schools and pupils. "The job of chief inspector is not one of de facto cheerleader for whatever is government policy of the day," she said. "I think she will need to reassure the public that her ties to the current government won't affect her ability to carry out the role properly." Ms Gilbert spent 18 years in teaching, including eight as head of Whitmore High School in Harrow, north-west London. Her appointment as chief inspector was confirmed following a meeting of the Privy Council on Wednesday. Mr Smith has been chief inspector since David Bell moved to become permanent secretary at the Department for Education and Skills last December. He had made clear he would not seek the permanent position. Ms Gilbert's predecessors were Stewart Sutherland, Chris Woodhead, Mike Tomlinson and David Bell, as well as Mr Smith.